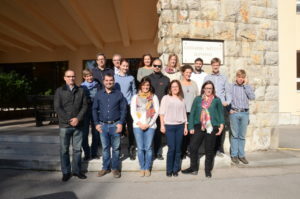 T he Project BIOMASUD PLUS from the program Horizon 2020, coordinated by the Spanish Biomass Association (AVEBIOM), has held its second follow up meeting last 4th and 5th October in the Slovenian Forestry Institute’s offices (GIS in Slovenian) which are located in the capital of the country Ljubljana. In this meeting were present all the partners that are part of the multidisciplinary team that the consortium is formed of: AVEBIOM, CIEMAT, PEFC and Tercera Fase Software on behalf Spain, CBE from Portugal, AIEL from Italia, BIOS from Austria, CERTH from Greece, ZEZ from Croatia, Tubitak from Turkey and the mentioned host GIS. The main objective of the project is to improve the BIOmasud quality and sustainability certification system, in operation since 2013 for Mediterranean biofuels, by including new biofuels, reviewing the sustainability criteria of the system and extending it to other interested countries. Currently the label is present in Spain, France and Portugal and, thanks to the BIOMASUD PLUS project, will also be implemented in Italy, Greece, Slovenia, Croatia and Turkey. In this second meeting the first conclusions of the studies of the biomass markets of each country (Spain, Portugal, Italy, Greece, Slovenia, Croatia and Turkey) were presented on the basis of which new biofuels will be incorporated into the certification. Although it is still necessary to characterize them and to study them, several were found as strong candidates because of their availability and potential: vineyard pruning (in fact, there is already a manufacturer of this type of pellets in Spain), olive pruning and some others will be tested such as pistachio or walnut shells. It was also discussed which biofuels will be selected to study their emissions in the partners’ laboratories. Initially, these will be: olive stones, vineyard pruning pellets and olive pruning pellets, although the partners involved were later reunited to choose them definitively. In addition, CERTH presented a study that reviews the manufacturers of stoves and boilers that can work with Mediterranean biofuels. Another work that is going at a good pace is the study of sustainability criteria, which will be incorporated into the BIOmasud certification system. Nowdays it already includes Greenhouse Gas (GHG) or energy balance limits (you cannot spend more than a percentage of energy in the production and transport of biofuel). PEFC, leader of the development of this task, has made a first version that will take into account criteria such as sustainable forest management, prevention of illegal logging (EUTR), carbon storage or land use change. Depending on the origin of the biofuel, certain criteria will be applied or not. Later on, events and meetings will be held in which this proposal will be reviewed by companies and experts from the sector of biomass and sustainability. In addition, in relation to sustainability criteria, CIEMAT presented a new methodology to measure the carbon footprint that takes into account the entire fuel life cycle. The complicated thing is to introduce this system with numerous parameters in the platform of BIOmasud so that it is quick and easy that the companies introduce the data to calculate the GHG emitted in the processing of its biofuel. This platform will be developed by the technology partner of the Tercera Fase Software project, who gave a short presentation explaining how they are planning to do it. There was also time to discuss more transversal issues such as administrative or communication. The next meeting of the consortium will be in mid-February in Greece. All this technical work was complemented by an obligatory visit to the beautiful city of Ljubljana and to one of its CHP (Combined Heat and Power) (about 300MW) in which a unit (50MW) runs on woody biomass) and in addition to generating electricity takes advantage of the excess heat to heat a district heating that gives service to a neighborhood of the city.